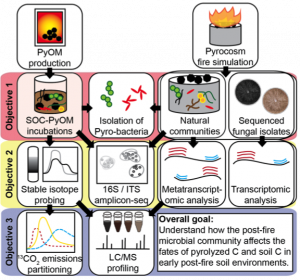 We are recruiting one Ph.D. student (UW-Madison) and three postdoctoral researchers (UW-Madison, UC-Berkeley, and the JGI) to work on a DOE-funded multi-institutional project investigating the role of microbes in post-fire soil organic matter (SOM) dynamics. 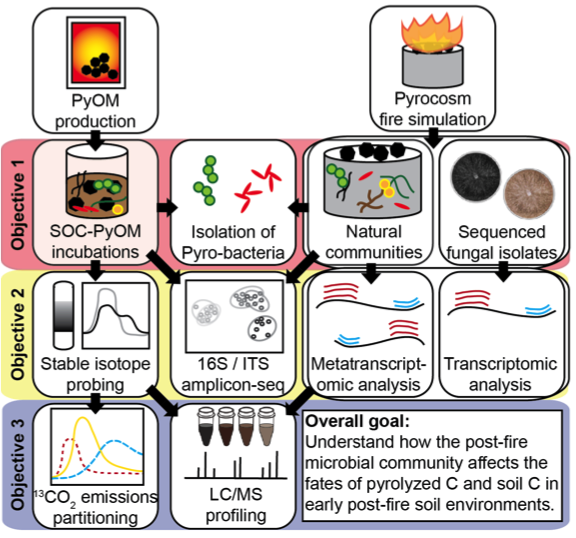 Post-fire soil systems have fundamental direct and indirect effects on global C storage. For example, fires result in the transformation of a large pool of C, which persists as dead and partially pyrolyzed material with long residence times and constitutes a significant C pool in fire-prone ecosystems. In addition, fire-induced hydrophobic soil layers, caused by condensation of pyrolyzed waxes and lipids, may increase post-fire erosion and lead to long-term productivity losses. Soil microbes are likely responsible for the cycling of all of these compounds, yet little is currently known about the organisms or metabolic processes involved. Successful candidates will join a dynamic team of researchers to use a systems biology approach, coupling small experimental “pyrocosms”, highly controlled production of 13C-labeled pyrolyzed substrates, fungal isolates, genomics, transcriptomics, stable isotope probing of nucleic acids, gas flux analyses, and mass spectrometry to dissect the effects of microbes on post-fire SOM dynamics. For one postdoctoral researcher position and the Ph.D. student (Whitman lab, UW-Madison), the ideal candidates will have expertise and interest in the following areas: microbiology and soil science, stable isotope probing of DNA, culturing, bioinformatics, microbial community ecology, soil carbon cycling or pyrogenic organic matter cycling, soil incubation studies, and gas flux tracing using stable isotopes. For the second postdoctoral researcher position (Traxler lab, UC-Berkeley), the ideal candidate will have expertise and interest in metabolomics, high-resolution mass spectrometry, and HPLC. Applicants with experience analyzing soil or other high-complexity sample types will be given extra consideration. For the third postdoctoral researcher position (Grigoriev lab, JGI), the ideal candidate will have interest in fungal genomics and experience with bioinformatics algorithms, data mining, and genomics data analysis, programming experience and familiarity with database systems. Positions could start as soon as September, 2016. If you are interested in this project, please contact us at twhitman@wisc.edu, mtrax@berkeley.edu, or ivgrigoriev@lbl.gov, sending a statement of interest and your cv. We will be happy to meet with potential candidates at ISME in Montreal or MSA in Berkeley this August, or will invite applicants for in-person interviews.